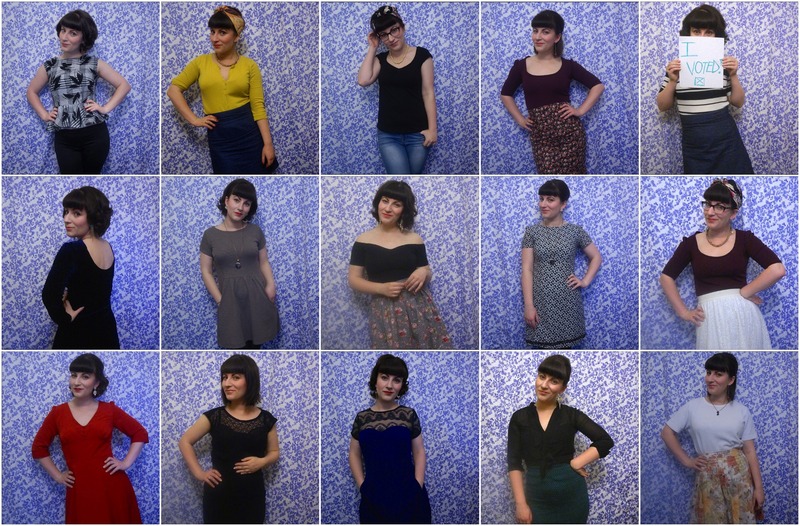 I found myself thinking about capsule wardrobes the other day. The concept is simple: it’s a mini-wardrobe of basic clothing you wear again and again. Everything’s versatile, so you can mix and match most pieces with each other. How practical! And how unlike me. My wardrobe is full of colourful florals – if my travels through capsule wardrobe Pinterest boards have taught me anything, this is block colour country. I’m not the type to buy into Pinterest-able concepts, truth be told. Isn’t it funny how most of the blogs you’ll find on capsule wardrobes specify at least 40 items? I thought this was meant to be a mini wardrobe! But anyway, there I was, thinking about capsule wardrobes, as you do, and up pops an email from Sew Over It – would I like to take a look at their new e-book offering? ER, yes please! This was last month, mind you, and it’s taken me a little while to get around to actually writing up my review. I’ve just this week moved to Germany (more on that another time), so everything’s been a whirlwind of packing. I haven’t even had a chance to actually make any of it yet, sob. 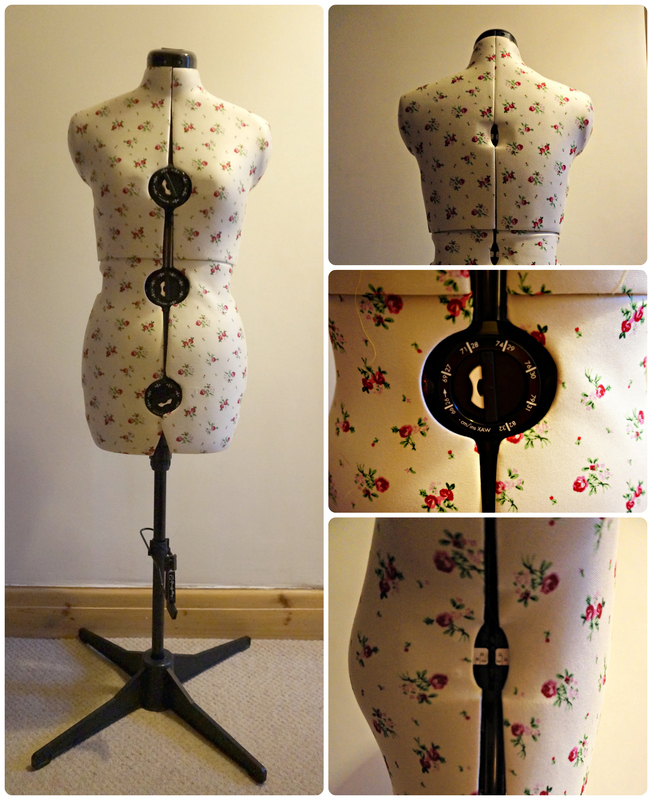 But once I’m reunited with my sewing machine, I’ll be straight on it. The e-Book comes with five patterns – the Erin skirt, the Molly top and dress, the Alex shirt and shirt dress, the Mia jeans and, my favourite, the Lola coat. Each item is designed to slot in with the others. As a result, you have an entire wardrobe of six to seven items for your city break explorations. After traipsing around Paris during Me Made May in a giant princessy pleated skirt, the idea of having some me-made jeans at the ready is particularly appealing. I’m not one for printed patterns these days. I much rather books or PDFs, even if tracing or taping together can be a pain. And this is both in one! Each pattern comes with beautifully photographed instructions, which we’ve come to expect from the Sew Over It line. And the pictures of Lisa out and about in Paris in her patterns are just lovely. So, if you’re anything like me, making stuff without thinking about how it fits in with the rest of your wardrobe – then this could be the e-book for you. Merry Christmas to everyone! I hope your stockings were full of sewing goodies and you’ve had a great day with the family. I know I have! Well, the cat likes her present anyway. Merry Christmas everyone! The past month has been a touch hectic as you can imagine but I’ll get round to posting some updates (including on my coat!) as soon as I’m back in London. Well, it’s been a little while since I’ve had a chance to update, hasn’t it? It’s also been pretty slow on the sewing front. I finally got around to starting my Clover muslin this week and am already a little bit stumped. So can you see those creases at the front of the trousers going towards the crotch area? I have no idea what causes those, or how you’d sort them out! 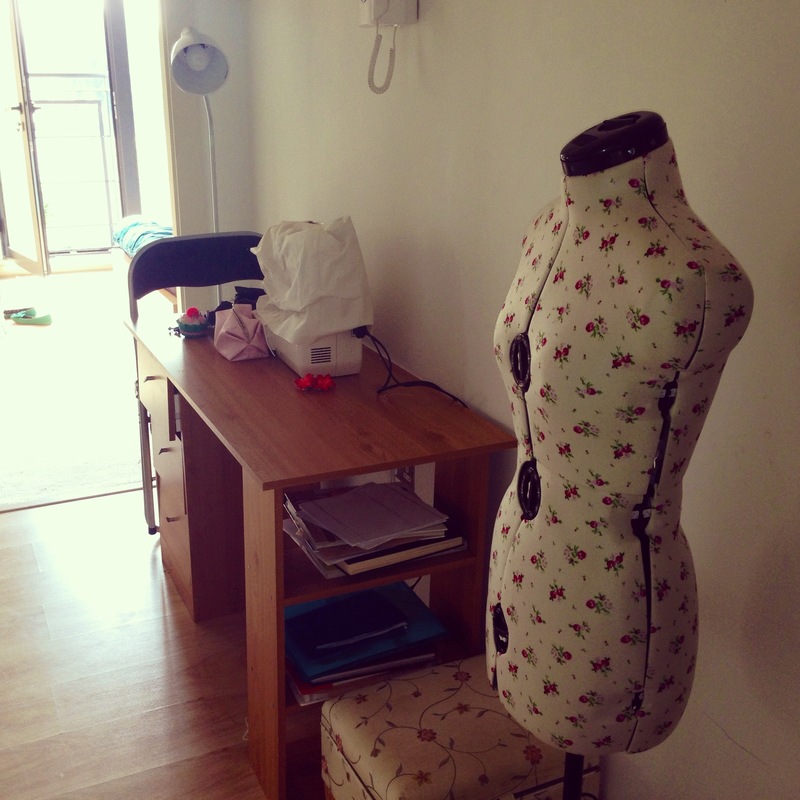 Meet Dorothy, my lovely sewing assistant – or mannequin, if we’re going to be formal about it. I’m only getting around to blogging about her now because, when she first arrived, I was in the middle of a horrendous bout of tonsilitis and didn’t really care to open up the huge box she came in, let alone write about it. I’d been mulling over buying a dummy for a while. 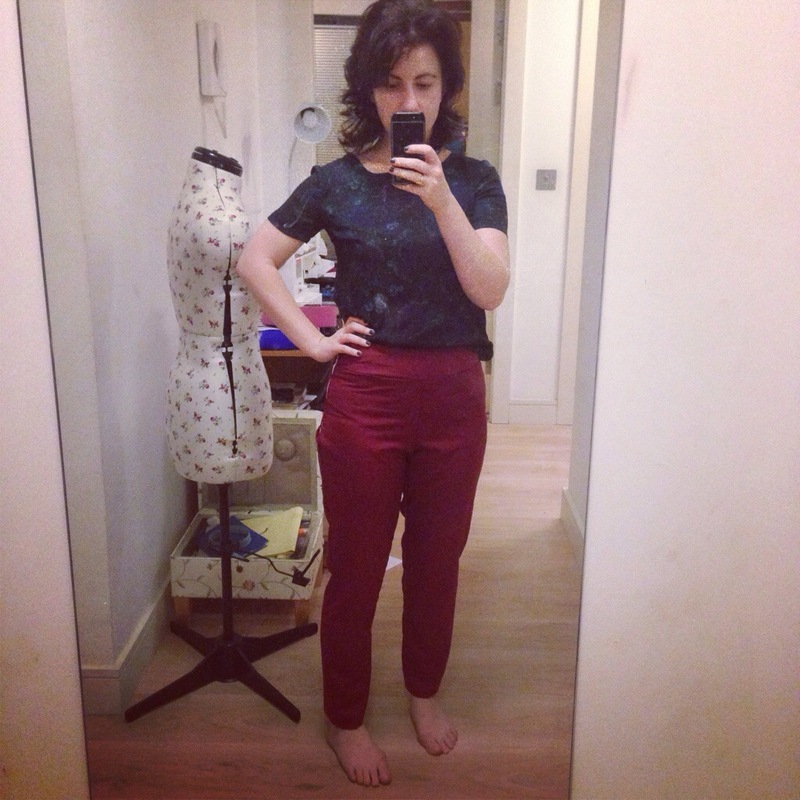 I think every sewist can make do without one, but you can’t really deny the benefits. For example, it was so much easier to visualise the ‘80s blouse refashion after I popped her on Dorothy and had a look at how I could change up the neckline and work darts into the front. It’s just so much easier to fit a dummy with your measurements rather than become a human pincushion as you try to awkwardly make alterations while still wearing your muslin. The body itself is split into eight parts, which can be adjusted using one of 12 wheels – three on the front and back and three on either side. If you’re thinking of buying a dummy, do check the measurements – the minimum measurements shouldn’t be bigger than yours, otherwise the mannequin is no good to you. Dorothy’s slightly padded, meaning I can stitch pins in on an angle. There’s also a great hem marker on the bottom – hems are my least favourite part of the dressmaking process, so hopefully it’ll come in handy. So far, I’m a happy customer! And I just love the design on the fabric. If you want one like this, you can buy it here.